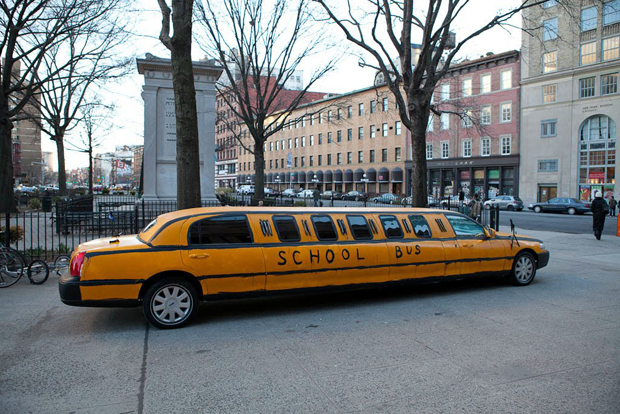 Bruce High Quality Art Foundation limo used on the Teach 4 Amerika Tour, 2011. I am so pleased to be able to continue to present international critics, writers, artists and curators to the readership of The Art Section. It is absolutely vital to any art community not to become fixated on the local only but always to seek beyond boundaries and limitations. So it is an honor for me to present a conversation between the artist Thomas Eller and curator David Elliott, to have Floriana’s Piqué’s meditation on Nicola De Maria’s work, and Harry Weil’s enthusiastic engagement with the Bruce High Quality Foundation at the Brooklyn Museum. I myself found BHQF’s Thelma and Louise parody very funny. It is not often that I laugh out loud at works of art … though that’s not such a bad idea. One of our readers, the artist Nicolette Reim, submitted per our request in the last issue that our readers share their experiences of exhibitions with us, some thoughts about her trip to Denver, to the Denver Museum in particular where she saw shows of Mark Rothko and Nick Cave. She examines both exhibitions and gift shops with humor and wit. Thank you, Nicolette! And I hope for more news and observations from you and other readers. Thank you, TAS writers! And thank you, TAS readers. Published by Charta Art Book Milan, Italy 2013 and distributed by DAP. The gallery is at 547 West 25th street, NYC, NY. Most of the nine artists will be present and will sign books! They include Jennifer Bartlett, Louise Fishman, Jane Freilicher, Joyce Kozloff, Elaine Reichek, Joan Snyder, Pat Steir, Ursula von Rydingsvard, and Betty Woodman. Deanna Sirlin, Editor-in-Chief of The Art Section, recently published a book, She's Got What It Takes: American Women Artists in Dialogue with Charta Art Books.